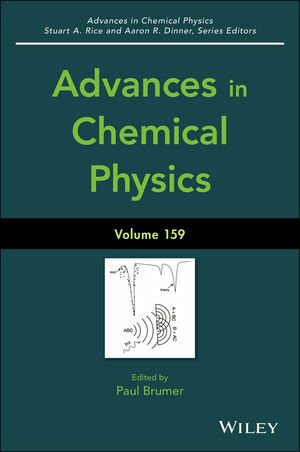 This volume of Advances in Chemical Physics is dedicated, by the contributors, to Moshe Shapiro, formerly Canada Research Chair in Quantum Control in the Department of Chemistry at the University of British Columbia and Jacques Mimran Professor of Chemical Physics at the Weizmann Institute, who passed away on December 3, 2013. It focuses primarily on the interaction of light with molecules, one of Moshe’s longstanding scientific loves. However, the wide range of topics covered in this volume constitutes but a small part of Moshe’s vast range of scientific interests, which are well documented in over 300 research publications and two books. Paul Brumer is Professor of the Department of Chemistry at the University of Toronoto, and is one of the world's leading theoretical chemists. He has been at the forefront of two major areas in chemical physics: using nonlinear mechanics to understand molecular dynamics, and controlling chemical reactions with lasers. He has been an A.P. Sloan Foundation Fellow and is a Fellow of the Royal Society of Canada, the Chemical Institute of Canada and the American Physical Society. He has received two Canada Council Killam Research Fellowships and is one of the youngest recipients of the CIC Palladium Medal, the highest award of the Chemical Institute of Canada. He was the recipient of the prestigious 2000 Killam Memorial Prize in Physical Sciences and is currently the Roel Buck Chair in Chemical Physics. Aaron R. Dinner received his bachelor's degree and doctorate from Harvard University, after which he conducted postdoctoral research at the University of Oxford and the University of California, Berkely. He joined the faculty at the University of Chicago in 2003 and is the Principal Investigator of The Dinner Group, which develops and applies theoretical methods for relating cellular behavior to molecular properties.